The Atlantic Refit Centre in La Rochelle and engineering firm Eiffel Industrie have been chosen to lead the development of the French port of La Rochelle to attract superyachts, which could include berths for yachts up to 150 metres. The La Rochelle port authority put the project, called Your Atlantic Shipyard, out to tender in 2013 and has selected the Atlantic Refit Centre and industrial engineering company Eiffel Industrie as joint winners. The two companies have worked together in the past. Stéphane Marcelli, General Manager of Atlantic Refit Centre superyacht yard, which is based in the deepwater port of La Rochelle, said early plans included an idea to install berths for superyachts up to 150 metres. 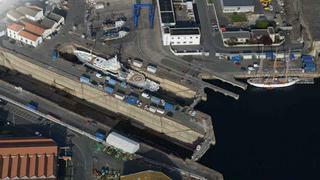 La Rochelle hopes to become a superyacht refit yard to rival Pendennis in Cornwall, across the English Channel. Atlantic Refit Centre was responsible for the refit of 71 metre Enigma XK, which won an award in Boat International's World Superyacht Awards. Marcelli has said in the past that the development plans included a large wet basin in La Rochelle. Now he sees the space best utilised as a marina, offering berths up to 150 metres, and workshops for crew, noting the importance of being able to welcome superyachts and their crew for the winter refit period. He emphasised La Rochelle’s welcoming climate and warm, bustling atmosphere, with the ancient walled town full of students and French life all year round. With staffing in mind, the Atlantic Refit Centre has evolved its plans for an apprenticeship scheme and the centre is in discussions with local maritime schools and colleges about a suitable training programme to prepare young people locally to work in the yard and the superyacht industry. Meanwhile, the Atlantic Refit Centre’s big plan to cover the dry dock is still on track, with a feasibility study being done and build time estimates made. Marcelli said he hoped it would be ready for September 2017. Atlantic Refit Centre was set up in 2008 to cater for superyachts between 25 metres and 150 metres and currently offers two dry docks, the largest at 176 metres, as well as floating dock space for repairs, engineering, painting and general maintenance.